Later this year, the Philatelic Foundation will move into the Stanford White brownstone on East 35th, sharing digs with The Collectors Club. Clark Orr imagines postage stamps as a series of 80s pop culture characters and references. Illustrator Claudia Musset has created a series of charming animated stamps using familiar architecture settings. Redact! Redact your words or anyone else's with a Confidential Roller Stamp. Cherrystone Philatelic Auctioneers has auctions every two months or so. 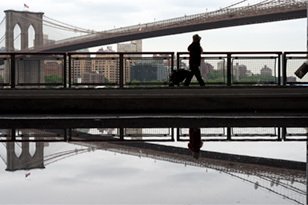 You can bid in person at their gallery, 119 W. 57th [6th/7th] or online. Next up: U.S. and Worldwide Stamps and Postal History, June 13-14. DIY: Create your own (legal) postage stamps. Eastern National is the organization that runs the Passport to National Parks Program which offers kids (of all ages) a stamp in their passport when they visit national parks and properties. Champion Stamp, 432 W. 54th [9th/10th] is the city's last street-level retail stamp store. Get your rubber stamps at The Ink Pad, 37 7th Ave. [13th] and Casey Rubber Stamps, 322 E. 11th [1st/2nd]. The Smithsonian National Postal Museum has a nifty exhibit online titled New York City: A Portrait Through Stamp Art. Pictured is GCT illustrated by Dan Cosgrove. Just issued, U.N. Stamps issued to commemorate World Environment Day on June 5. 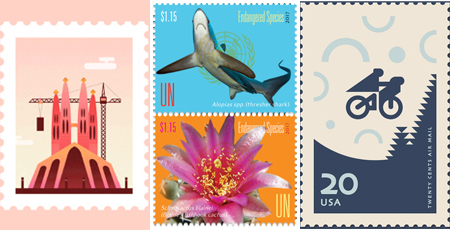 The Endangered Species stamps were designed by Rorie Katz.